Veronica Conti’s on a mission. She wants a trophy. She needs a trophy. She will not rest until a glorious golden trophy is in her hands! So when her school’s 100 Day Contest is announced, Veronica vows to take home the grand prize. But when Veronica gets teamed up with none other than Matthew Sawyer, her biggest enemy, she thinks all hope is lost. Matt gets distracted and has a history of losing stuff, not to mention that he and Veronica can’t stop arguing. To win the prize, Matt needs to organize. And to do that, he needs the Fix It Friends! Together, the friends help Matt and Veronica discover that unexpected friendship is the best prize of all. 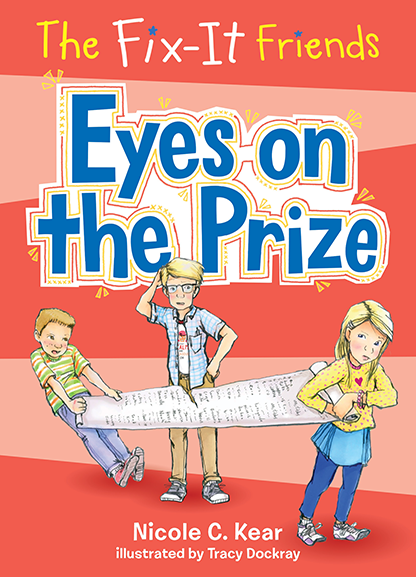 Eyes on the Prize is the fifth adventure in this funny and relatable chapter book series that teaches emotional intelligence. It includes tools to stay focused, which are applicable for kids with ADD and ADHD.